While the “follow” feature sounds like an easy and simple addition at Swapit — and it was technically easy and simple for us — the following of other Swapit users catapults the Swapit platform into the universe of social media or more so, social e-commerce. When buyers start following sellers, all of a sudden, a new channel for product discovery is created. Sellers with more followers will have a higher chance of selling their products faster. Swapit’s great and engaging community can now connect directly with each other and follow each other on a 1:1 social connection. Through that, Swapit will be able to build up a social graph based on the user to user following that allows us to better serve both our sellers and buyers on the Swapit platform. 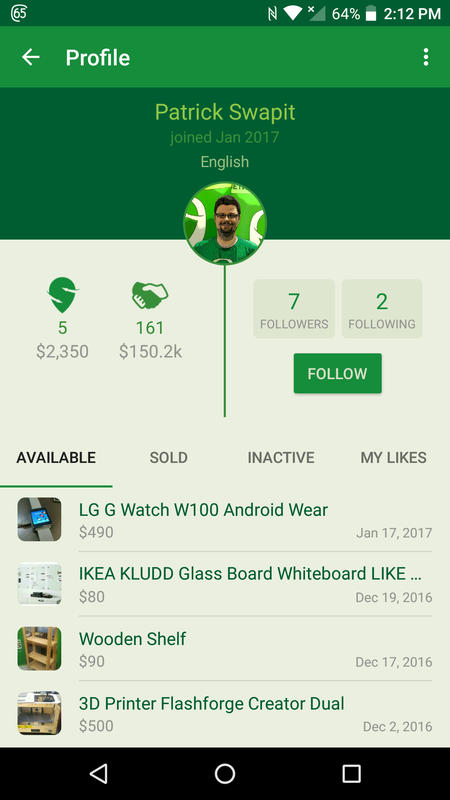 In the future, we will be able to provide more targeted content to buyers compiled from their following profile, combined with the items they like and the categories they have been posted in. Traditional classified media are not able to do this. They will lose in relevance over time because they can not provide targeted content to their users. This simple “Follow” feature is one key part to provide very targeted content to our Swapit users. Stay tuned for more changes on that front. As always, we only add a new feature to Swapit if it is super easy to use. At Swapit, we aim for a “zero-learning-curve” product, which can be used out-of-the-box without the need for reading any user manual. Our latest “Follow” feature is no exception to that. In any user profile you can now easily hit the “Follow” button and you’ll be following that user from now until you unfollow that person. It’s really that simple. Besides the fact that we had this feature on our roadmap from the onset, the great feedback we collected from our loyal Swapit users via surveys and other channels, has led us to raise the priority for this feature. As a result, we’ve added this now and not at a later stage. Our roadmap for product improvements to make our marketplace even more efficient, is almost endless. We constantly receive feedback and suggestions from our user-base, which is extremely valuable to us and is always put into consideration when we make adjustments to our roadmap. Therefore, thanks a lot to everyone who has provided their feedback thus far. We trust you will keep it up and we love you for it! We’ll be posting the “Swapit Item of the Week” on our @swapitla Instagram account as well as other interesting items and sellers on Swapit. Make sure to follow us on Instagram, there might even be some exclusive promotions popping up on Instagram — especially when you least expect it.